I’m in this really cool anime fan group on Facebook. The group is pretty big, I would say in total there are about 500 members. Pretty much all we do is share funny anime memes and debate different topics. The debate’s in the group are usually typical, you know the usual stuff: Who has the best fight scenes, Top 10 all-time lists, Senju or Uchiha, that kind of thing. But once in a while, a particular topic comes up that usually leads to a 100+ comment thread, full of passionate mid-20-year-old men and women, who apparently, have way too much time on their hands. Yes, I am talking about the infamous debate of “Who would win a fight: Naruto or Goku?. Honestly, my personal opinion is that the answer to this question is pretty clear. Non the less this debate seems to captivate the entire group whenever it takes place, which seems to be often. So let’s take a closer look at these characters and end this debate for good. Warning** things are about to get Nerdy. 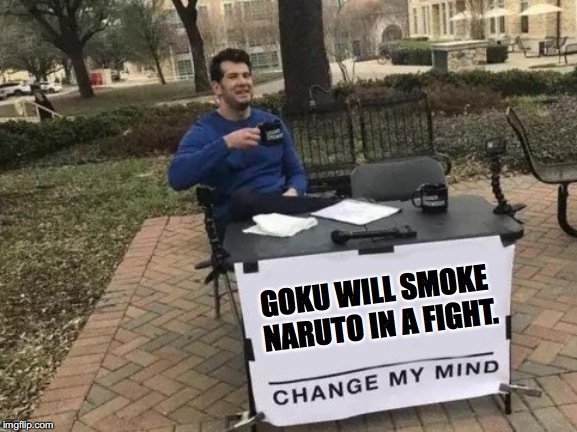 Obviously, we’re discussing fictional characters so it’s not like we’ll ever pull up to the leaf village and witness Goku and Naruto scrappin at the front gates. But we can definitely conclude a few things about their strength levels based on some general details shown to us in both series. When we do this, we see that the power scaling for both characters is light years apart. I’ll provide examples of this later, for now, let’s start with my pick. If Naruto got into a fight with Goku I think the winner would most definitely be:. I chose Goku for what I believe to be obvious reasons. If we take a look at the latest Dragonball Series, there are plenty of episodes that give us an idea of Goku’s actual strength level. Here’s 1 scene to support my argument. So here you see Goku go head to head with, at the time, the strongest individual in the Dragonball Universe. Although Beerus was not at top strength, it’s still pretty incredible Goku held his own, and he had to literally become a god to do so. Look I’m sure you enjoyed that clip, even if like me you’ve seen it 100 times. If I’m being completely honest, I think Naruto is the GOAT anime. But when it comes to him fighting Goku, we have to be realistic. Naruto is only a human after all. Not to mention Naruto needed Sasuke’s help to fight an alien. Newsflash! Goku is an alien! The last of a warrior race, oh and by the way, he’s also died 3 times, and cares more about fighting than his family. Did I mention Ultra Instinct? Good luck Naruto! A human cannot beat Goku, it doesn’t matter how much chakra they might have. So to the individuals out there who really believe Naruto stands a chance, I just want you to think about this: Naruto’s strongest offensive attack is his “Rasenshuriken”. Which to Goku; is probably nothing more than a Krillin level Destructo Disk waiting to be effortlessly slapped away. Unless we’re talking about a 1v1 match of Jump Force, Naruto could never beat Goku. What do you guys think? Leave a comment below and let me know who you think would win. Previous articleThe Singular Use of “They”: Language Evolves? They’re back: Here’s four anime that are coming back for more this 2019!